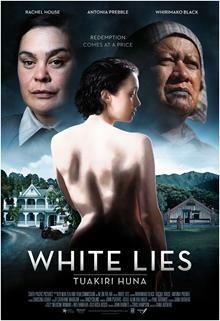 Look out for shots of Alberton, Ewelme Cottage and Highwic in White Lies now playing at New Zealand cinemas around the country. The three Auckland houses cared for by the NZHPT serve as sumptuous backdrops for the movie which is based on a novel by Witi Ihimaera. Alberton is also featured as a backdrop for a photoshoot in the July issue of Australian Women’s Weekly in a spread about the women of White Lies. The film is picking up good reviews, and has been described as "beautifully bleak" by the New Zealand Herald. Click here for a trailer of the film. Don't miss Between Two Worlds – an exhibition of photos in the Kerikeri Stone Store attic featuring work by Sheree Edwards, a third-year Bachelor of Applied Arts student at NorthTec’s Kerikeri campus. Inspired by the cross-cultural history of the Stone Store area and the artist’s own bicultural heritage, the show will run until 21 July. A fee normally applies to the Stone Store’s attic displays, but free tickets are available for the duration of the exhibition. Master toymaker Richard Lees, of Tinderbox, will lead a Toy Making holiday progamme on 24 July in which children will be able to learn about Victorian toys, and have a go at making a simple toy themselves. The 24 July holiday programme will include an hour-long morning session beginning at 11.30am, and an afternoon session beginning at 1pm. Children must be accompanied by an adult, however, and bookings are essential. To book – or for more information – contact Highwic on Ph (09) 5245729 or email highwiceducation@historic.org.nz. 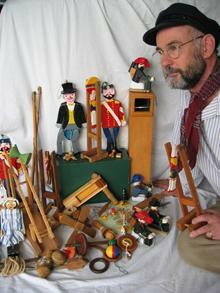 Below: Richard Lees – toymaker extraordinaire. The Andrew London Trio also features Kirsten London on bass and Nils Olsen on sax, clarinet and flute. Most of their repertoire consists of Andrew’s original songs although a few of Nils Olsen's compositions are starting to sneak in. Stylistically the Trio hovers around the jazz, swing, country and blues genres with a large element of musical comedy and satire. 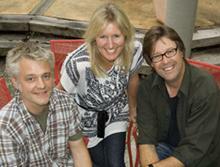 Below: The Andrew London Trio, from left, Nils, Kirsten and Andrew. Free lunchtime concerts at Old St Paul's - check out the lineup here. New Zealand’s second oldest building has been temporarily closed to the public – but there’s a very good reason. Te Waimate Mission – built in 1832 and now cared for by the NZHPT – is currently being re-roofed with wooden shingles which, once completed, will recapture some of the building’s distinctive character and charm. “When Te Waimate Mission was built just over 180 years ago, the roof was clad in kauri shingles,” says the NZHPT’s Northern Heritage Destinations Manager, Natalie McCondach. The solution to the problem is to reinstate the shingled roof. “Because it’s not practical or cost-effective to use kauri shingles we’ll be re-roofing the building with Western Red Cedar shingles,” says Natalie. “Cedar has the advantage of fading back to a very similar colour to kauri shingles in a short period of time, and the shingles are more durable – we can expect at least 20 years of life out of them. Re-roofing one of New Zealand’s oldest buildings has not been entirely straightforward. “Te Waimate Mission has some wonderful items in its collection, and with the roof coming off these have had to be carefully wrapped and securely stored while work is being completed,” she says. In the meantime a giant canopy has been erected over Te Waimate Mission to protect it from the elements as the existing roof materials are taken off. Henwood Builders of Kaikohe, who re-shingled the Stone Store in 2011, are also doing the re-shingling work at Te Waimate Mission. “Unfortunately there will be some inconvenience for visitors while work is progressing and we apologise for that. Te Waimate Mission will be open again in early September,” says Natalie. Photo: Te Waimate Mission being prepared for re-shingling. A major restoration project on the historic Clifden Suspension Bridge in Southland has been completed. The 111.5 metre bridge is located on an historic reserve administered by the New Zealand Historic Places Trust and spans the Waiau River. It was opened on 5 April 1899 by Sir Joseph Ward, and remains the longest suspension bridge in New Zealand. The bridge, which is managed by the NZHPT and registered as a Category 1 Historic Place, was closed by the NZHPT in 2010 after an inspection report identified structural deficiencies. NZHPT Heritage Destinations Manager for the southern region, Paul McGahan says conservation work included replacement of some of the bridge’s bearers, in addition to maintenance to suspension ropes, bolts and bracing. Mr McGahan says the restored bridge will evetually include new interpretation panels telling the story of the bridge’s history. A World War One memorial located on one of the bridge’s towers has also been restored. The Memorial honours members of the local community who took part in the war. Mr McGahan says it’s a relief to finally have the project completed, and says the fundraising effort showed a huge level of support for the bridge, from right around New Zealand. NZHPT Funding Development Manager Brendon Veale says that along with the donations that came across his desk, there were also some lovely stories and fond memories shared of the iconic Southland landmark. “It was clear that people had an affection for the place,” he says. As well as financial support from members and supporters of NZHPT, there were also generous donations made by New Zealand engineers, following notices placed in the recent IPENZ membership magazine. “We’re absolutely thrilled with the warm response we received. In total, around $70,000 has been donated from supporters for this project and I would like to thank each and every one of them”. The first bridge over the forceful Waiau River, the Clifden Suspension Bridge has historical importance because it promoted social and economic expansion in west Southland until it was replaced as a highway asset in 1978. A programme of events celebrating the 150th anniversary of Alberton, the NZHPT property in Mt Albert, is about to begin. “We have a number of special events planned,” says the Manager of Alberton, Rendell McIntosh. The original homestead part of Alberton was built for Allan Kerr Taylor and his family in 1863. A maximum of 50 people can be accommodated in the ballroom for the exclusive dinners, which will feature a four course meal and refreshments. “Other special events include two 150th Anniversary Balls on 31 August and 14 September,” says Rendell. In addition, an exhibition of artwork capturing Alberton over the years will feature in the Auckland Heritage Festival (October 5-13). Alberton will also host some special performances, including The Magic Flute concert (1 September) with the Starlight String Quartet and friends; a Classical Guitar Concert featuring internationally recognised guitarists Bruce Paine and Rex Button, (7 December); and the Twelve Days of Christmas concerts (17-19 and 21-22 December). “It’s going to be a very exciting time at Alberton over the next few months with a lot going on. We’re encouraging people to mark our anniversary events on their calendars so they don’t miss out,” says Rendell. Alberton is open to visitors Wednesdays to Sundays between 10.30am-4.30pm, and is popular as a venue for special celebrations and meetings. 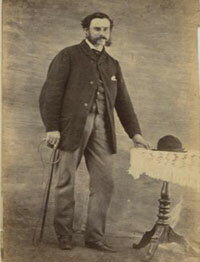 Photo: Allan Kerr Taylor, master of Alberton (NZHPT Collections). The Imperial Buildings project in central Auckland has won New Zealand’s top architectural award. The revitalised historic building complex comprising the Imperial Building and the Everybody’s Building – which incorporates the former Roxy and Queen’s Theatres – picked up both the award for the Heritage Category and the New Zealand Architecture Medal at the recent New Zealand Architecture Awards. “The Imperial Building is a great example of adaptive reuse creating quality hospitality and commercial office space as well as some really vibrant public areas,” says the NZHPT’s Heritage Adviser Architecture, Robin Byron. The NZHPT was supportive of the approach that the architects took with the project to retain the layers of material intervention over time, including their decision to leave surviving remnant elements of the old theatre buildings in place, serving as an effective reminder of the building’s past, while also adding character to the development. “The heritage fabric and features that have been retained work well with the new modern insertions, with both enhancing one another. The modifications that were required to create a new passage connecting Fort Lane and Queen Street – establishing a vibrant urban link – was also supported by the NZHPT,” says Robin. This is the second year in a row that the winning building in the Heritage Category has gone on to win the supreme award, with the Auckland Art Gallery winning last year. Photo: The Imperial Building internal plaza – part of the award-winning Imperial Buildings project. The NZHPT has continued its community meetings throughout the Central region to brief property owners on seismic resilience requirements, with over 70 people attending a public meeting in Marton on 30 May. Win Clark, a leading structural engineer and executive officer of the New Zealand Society for Earthquake Engineering, urged property owners to get assessments undertaken now on their properties to establish what elements of their buildings could be at risk in a sizeable earthquake. "It's important that certain features of buildings - chimneys, parapets, and front facades in particular should be checked to see if they could be severely damaged in an earthquake," said Win. Win outlined to the meeting the learnings of the Christchurch earthquakes with graphic photos showing the extent of building damage. Win was supported at the meeting by representatives of Aon New Zealand who spoke on insurance issues for property owners and backed up the advice given to show insurance companies what steps people are taking or have taken to deal with risks to their properties. Each building's insurance needs should be determined on a case by case. Earlier in the day Win Clark visited the historic St Stephens Church in Marton to learn about conservation and preservation actions that the church has taken with strong community and funding institutional support. 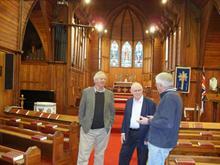 Photo: Win Clark (centre) talking with John Vickers, a former Mayor of Rangitikei (left) and John Haswll (right), a member of the St Stephens Church building committee. Over 600 people attended a series of Heartland Archaeology public talks and field trips organised by the NZHPT in Northland, Auckland, the Coromandel Peninsula and the Bay of Plenty. The series aimed to connect people with their local history, and raise awareness and understanding of local archaeological features, as well as the work of the NZHPT and its role with archaeology under the Historic Places Act. Feedback from people attending the talks was overwhelmingly positive, with many people providing NZHPT staff with valuable local historical and archaeological information at the talks ranging from the location of hitherto unknown historic rail tracks through to the exact location of the wreck of the HMS Buffalo off Whitianga. The series of public talks also generated opportunities for future meetings with individuals and organisations with an interest in heritage, which NZHPT staff will be following up on. Image: HMS Buffalo, which was wrecked on the main beach at Whitianga, Coromandel, in July 1840. 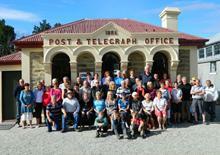 Residents of Ophir gather outside the Category 1 Ophir Post Office on 4 March 2013, the day after the Ophir Gala Day - celebrating 150 years since the discovery of gold in Blacks (Ophir). Over 1000 people lived in Ophir in the gold rush years of the 1860s – the population today is close to 100 people, approximately 60 of whom are permanent residents. Learn more about historic Ophir on the NZHPT's online register. 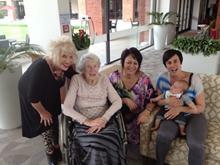 Five generations came together at Alberton recently to celebrate the 96th birthday of Syliva Dann. Sylvia – the Great Great Grandmother of the family’s newest addition, Griffin Cardno (pictured with mum) – was joined by Griffin’s Great Grandmother (Lesley Reihana, left); his Grandmother Shiree Reihana (third from left); and of course proud mum Kiri David (right). The family chose Alberton on the recommendation of leading New Zealand artist and family member Lisa Reihana, who held an exhibition of her work at Alberton. “We were thrilled to be chosen to host Sylvia’s birthday celebration, and it was particularly special having five generations of her family here at the same time,” says the Manager of Alberton, Rendell McIntosh. Photo: Sylvia Dann (second from left) celebrating with different generations of her family. A dedicated and passionate supporter of West Coast heritage, Les Wright, passed away in May. Les was closely involved with the NZHPT in both commissioned and voluntary roles over many years. For 20 years, from the early 1990s, he was an active member of the NZHPT West Coast Branch Committee, and had been Secretary between the years of 1995 and 2002. He was also actively involved with a vast number of other heritage organisations. Les engaged frequently with the various NZHPT archaeologists and his expertise and openness was highly valued. He will long be acknowledged for his archaeological assessments of mining archaeology and the recording of West Coast sites. He was an authority on places such as Waiuta, Big River Quartz Mine, and Denniston, and he published widely, generously sharing his findings and research. Les also provided authoritative contributions to a range registration reports for West Coast historic buildings, structures and areas, many of which can be seen on the Register Online. Les’s eloquent storytelling was legendary. In 2011, when the joint NZHPT-New Zealand Film Archive exhibition, Reel Life on the West Coast, toured the West Coast showcasing historic buildings as the venue for 20th century films, Les introduced the audience to recent restoration projects and contextual histories of the area. Staff at NZHPT had huge respect for Les and valued their regular communications with him. He will be sorely missed. Robyn Burgess, NZHPT Southern Heritage Adviser. 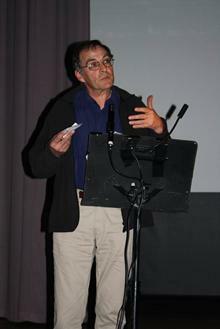 Photo: Les talking at the Reel Life on the West Coast touring exhibition, 2011. Once again Alberton has been utilised as a backdrop. This time for a music video for Tre-Belle, three classically trained singers who have performed in New Zealand, Australia and Europe. They perform cross-over works consisting of musical theatre, popular and operatic repertoire in stunning harmony. The performers are based in Wellington and selected a run down property in Waitakere and the lovely historic Alberton as the backdrops for their music video. Refer www.tre-Belle.co.nz to view the video, which will be released early this month. Pictured from left are Jennifer Little, Jess Segal and Karyn Andreassend. NZHPT Board member Allan Matson recently received a Good Citizen Award from the Waitemata Local Board for his tireless work in heritage matters. He was one of three people to gain an outstanding tribute citation in the individual category. Allan works on heritage matters both as an individual and in support of other persons and groups, to further the recognition and protection of built heritage, with a focus on the Waitemata Local Board area, in particular the CBD. His current voluntary positions include President of Civic Trust Auckland, membership of Auckland Council's Heritage Advisory Panel and a trustee of the St James Theatre Trust. Particular sites, places and areas Allan has advocated for over the past year include the St James Theatre, Carlisle House, the Queen's Head Tavern (facade), the Wong Doo Building, Shed 10, Khartoum Place and K’Road. He has already spent many hours attending meetings and researching and discussing the heritage aspects of the draft Auckland Unitary Plan and is deserving of this award because he is doing this work almost full time and largely unpaid, being willing to give freely his advice and assistance. His successes bring about protection and enhancement of the built environment of the Waitemata Local Board area for the benefit of not only current but future generations of Aucklanders and visitors.